A disappointing spy film adaptation of a John Le Carre novel, The Tailor Of Panama tries hard to create a steamy stranger in a strange land vibe, but it is undermined by a hollow centre and a premise that is close to ridiculous. British intelligence agent Andy Osnard (Pierce Brosnan) operates under diplomatic cover, and after flubbing an assignment is reassigned to Panama. Upon arrival he makes contact with Harry Pendel (Geoffrey Rush), a tailor peddling high quality suits to the ruling class. Pendel has a shady past and money problems but terrific contacts with both the powerful elite of Panama and the shady opposition. Osnard presses him into service to obtain and reveal sensitive information about future plans for the Panama Canal and an emerging underground revolutionary movement. But Osnard is playing a dangerous game way beyond the normal confines of diplomatic intelligence gathering. He attempts to charm Pendel's wife Louisa (Jamie Lee Curtis) into revealing information that she has access to from her work for the Canal authority, and he keeps the British Embassy staff at bay by seducing Francesca Dean (Catherine McCormack), one of the Ambassador's key assistants. Osnard finally pressures Pendel into revealing plans for upcoming upheaval in the country, setting in motion an international chess game from which only one person will benefit. Not many characters are likable in The Tailor of Panama, least of all Andy Osnard. 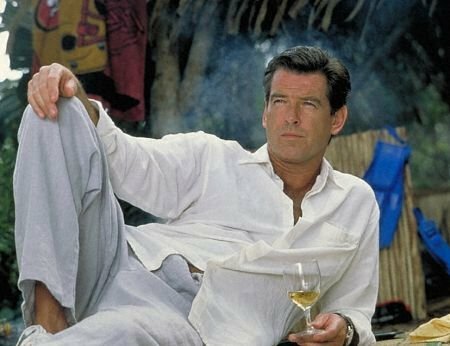 Brosnan attempts to bring his ice cool Bond persona into Panama, but in the absence of a suitable villain or a nefarious plot as a counterweight, it's not a fair fight. Taking advantage of less sophisticated locals and run-of-the-mill diplomats may satisfy Osnard's ego, but contributes nothing to an engaging narrative. Rush is more absorbing as the tailor Pendel, but his eagerness to please and the ease with which he is manipulated is unconvincing. The highly dubious plot developments do not help. Large amounts of international money and military hardware are set in motion based on flimsy and uncorroborated intelligence, and as we now know, only neo-conservatives in the White House with dreams of eternally controlling global oil supplies and avenging assassination plots targeting their daddies can pull that off. The Tailor Of Panama only has it's setting to fall back on, and director John Boorman tries hard to evoke a seedy Casablanca style mood of foreign intrigue, with Casablanca even being mentioned in one exchange of dialogue. But this is not the 1940's, World War Two isn't raging, Pierce Brosnan is not Humphrey Bogart, and the future of the free world is not at stake. The Tailor Of Panama attempts to put on a power suit, but there is no hiding the intellectual vacuum between its ears.